Downtown Dining Week for 2018 has been announced. 40 Downtown restaurants will offer amazing deals, often multi-course, for the low price of $20.18. (Some will offer lunch for $10.18.) Click the link to see participating restaurants and their menus. Many restaurants have menu “to be announced” at this early point in time. The dates are Monday, November 5 to Sunday, November 11. Let me repeat the advice I give every year: If there’s a restaurant you KNOW you want to visit for Downtown Dining Week, go ahead and make reservations NOW – even if they haven’t announced their menu. The most popular times at the most popular restaurants will get booked up quick. If you procrastinate, you might find yourself with a 5:00 or a 9:30 dinner seating – or no seating at all. However – I do want to ask you to not do one thing I heard some people did last year. “Well, we’re not sure whether we want to dine at McEwen’s, or Majestic, or South of Beale Tuesday night. So we made 6:30 reservations at all three, and we’ll decide the day of.” PLEASE don’t do that. It’s inconsiderate and unfair to both the restaurants and your fellow diners. When we get closer to time and menus get posted, I’ll come back and do a “Paul’s Picks” for DDW. For now I’ll do a “Can’t Go Wrong” list of places where I would gladly make reservations, menu unseen. First and foremost, Rizzo’s, where Michael Patrick always manages to offer a tremendous value every year. Felicia’s, McEwen’s, Majestic, and Bleu are on the list as well. Fourth Bluff will host the grand opening of River Garden at Mississippi River Park and the new River Line walking and biking trail on Friday, November 9. The Redbirds are looking to hire a Special Events Manager who will work aggressively to bring more weddings, conferences, and corporate events to AutoZone Park, as well as create new signature events. The Redbirds are also seeking a Motion Graphics Designer to join their team. A C-17 will conduct a military flyover at the end of the National Anthem at today’s Memphis-UCF game. From the DailyMemphian: Chef Gary Williams is back in the kitchen at Krewe of DejaVu at 936 Florida. The Flyer reports that there’s a GoFundMe effort to save the Gay Hawk, the popular soul food restaurant on S. Danny Thomas. The building is in need of extensive repairs. City Block Salumeria and Wok’n in Memphis will team up for an October Butcher Dinner on Friday, October 19. Courses will be paired with beers from St. Louis’ Earthbound Brewery. Very glad to hear that MPD and the Tennessee Highway Patrol have stepped up presence on local interstates in an attempt to get aggressive drivers off the roads. The people who go 100, weave in and out of lanes, never signal, and tailgate 3 feet behind the car in front of them are the problem – not the person going 72 in a 65 trying to get to work on time. Too bad it took several road rage-related deaths before the police shifted their focus. 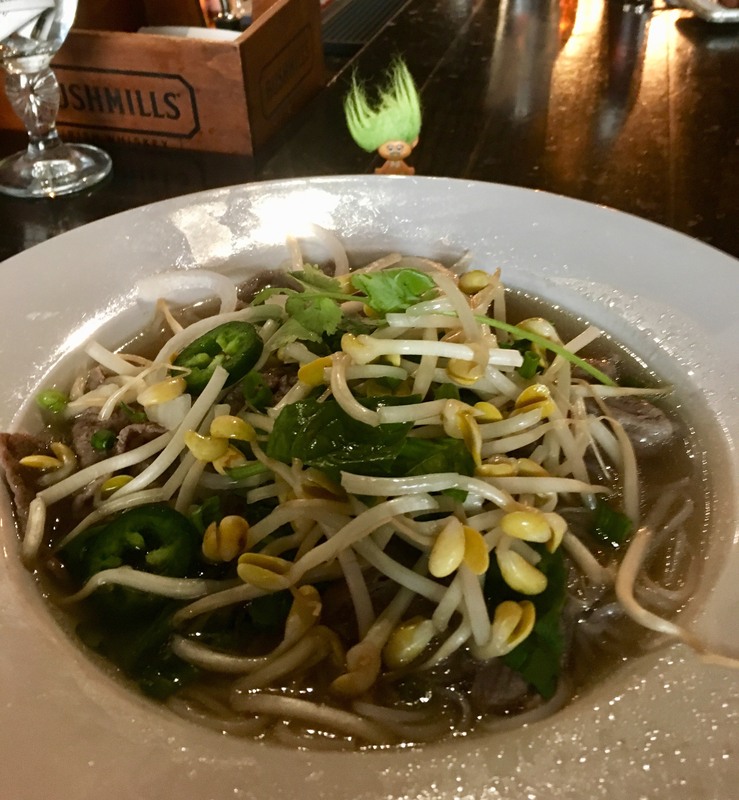 For the second day in a row, Bardog Tavern had pho, Vietnamese noodle soup, as one of its specials. I gave into temptation and ordered it. What makes pho such an interesting dish is that you can customize it to your liking. You start with meat and rice noodles. 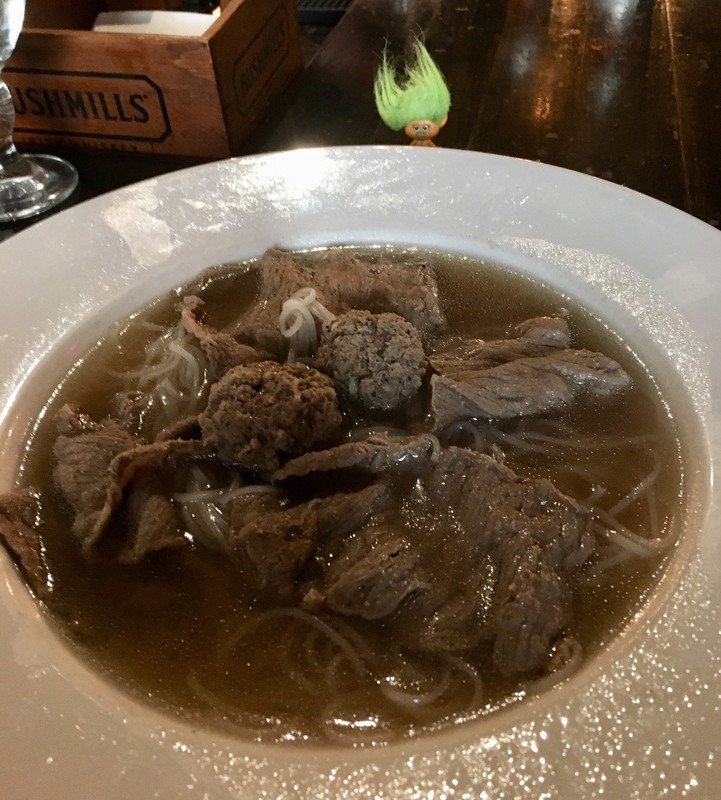 Bardog’s version of pho came with shaved New York strip and two meatballs. Then you get to decide what veggies you want to add to your soup. 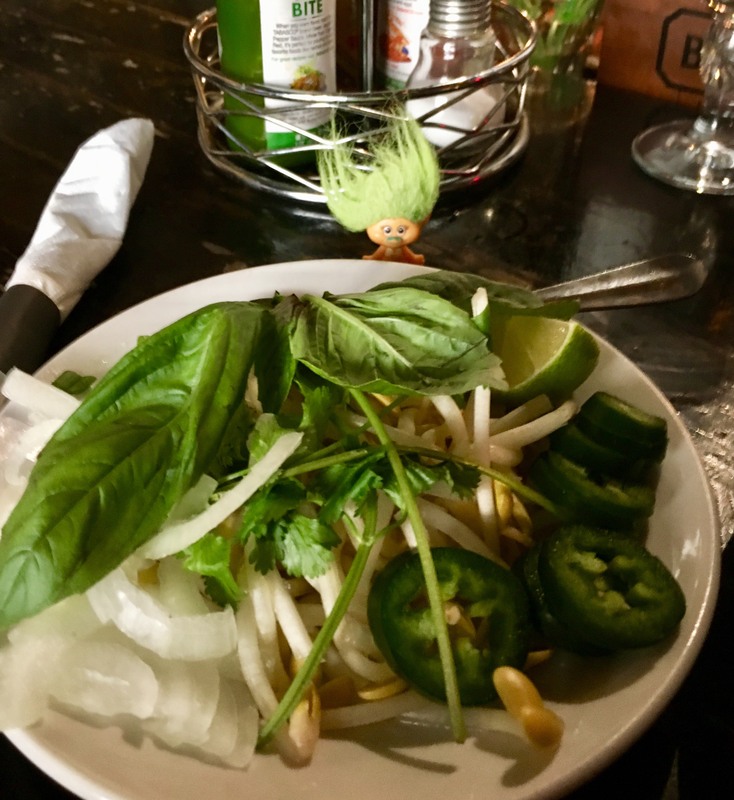 Bardog’s pho came with a plate of cilantro, bean sprouts, green and white onions, jalapenos, and a lime. My complete creation. I added almost all of the veggies to my soup, although experience has taught me to go easy on the jalapenos. This was yummy and was a special I never expected to see at Bardog. They’ve got it going on in the kitchen there. Unfortunately, with the closing of Oshi, there is no longer a place Downtown where you can get pho on a regular menu. There are several places not far away in Crosstown and Midtown that have it, Phuong Long being the one I hear the most talk about. I didn’t know until a couple of years ago that pho is pronounced “phuh” (rhymes with “ugh”), rather than “phoh” with the long “o”. There’s a restaurant in L.A. called “Pho King” and, knowing the correct pronunciation, that’s a really good name. A quick Google search revealed that there’s a restaurant in Houston called Pho Q Long. The Memphis Tigers host UCF in the Liberty Bowl in the biggest game of the Tigers’ year at 2:30. People are talking like a Memphis win would be a huge upset, but ESPN FPI shows UCF as a 54-46 favorite. That’s a probability I am well familiar with from playing poker. If you have a pair of Nines pre-flop, an opponent goes all in, you call, and he flips over Ace-King, you are about a 54-46 favorite and commentators term it a coin flip because it is so close to dead even. Assuming the Memphis that beat UConn, and not the Memphis that got blown out by Tulane, comes out to play, it will be close. One fumble, one interception, one missed field goal could make the difference. You don’t have to leave Downtown to get Nashville hot chicken today. Hattie B’s food truck will be at Ghost River noon to 7. They have six heat levels for their tenders – Southern, mild, medium, hot, damn hot, or shut the cluck up. 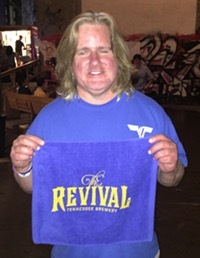 A word of advice, based on recent stories friends of mine have shared: If you’ve never had Nashville hot chicken before, don’t go above hot the first time. That’s it for now. Time for a long day of football. I’ll start off rooting for Auburn to embarrass Tennessee (although the Vols are quite capable of doing that without help). Next up it’ll be time to cheer for the Tigers to get a signature win over a Top 10 team, and after that I’ll be pulling for Arkansas against Ole Miss. Back tomorrow with more news.